OK - you knew it was bound to happen......I just have to resurrect the annual CIS thread this spring. It's only a few months until race season now and the weather is giving us a day here and there to drive our cars. In fact I drove mine today just for fun. - I had my exhaust headers ceramic coated. This is claimed to keep the exhaust gases hotter (aiding in expulsion and power) while at the same time keeping the engine compartment cooler (again aiding power). I have no idea how much might be gained but they now look nice! - I sent my throttle bodies back to England along with the ECU. The throttle bodies were under a recall and while they were at it they gave me a firmware update in the ECU that unlocks it so that I can make any changes I'd like. 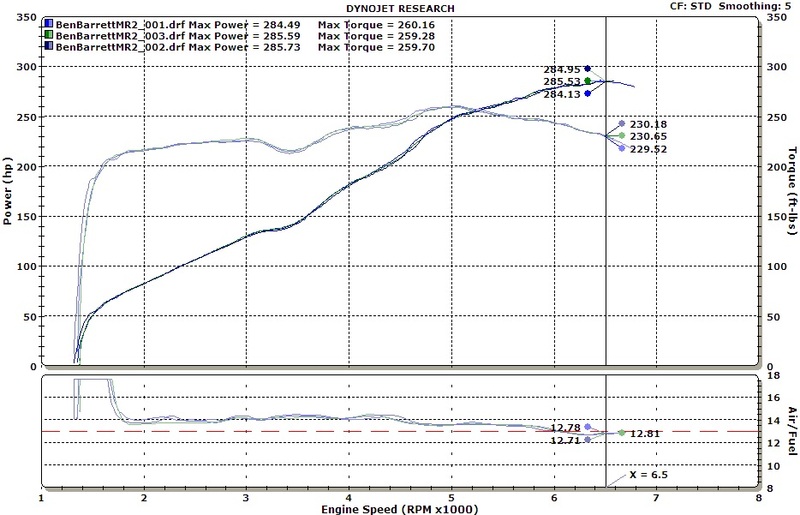 I can see a dyno session at CS Motorsports in my future to try and grab another ft/lb or two down low. - I made a new carbon tunnel top cover for the "interior". I just didn't like the way the old aluminum looked. It took off about a pound so I guess I can claim a weight savings. 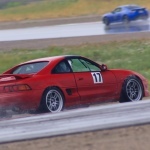 - Just today I ordered a new set of race wheels. The wheels I'd been using worked fine but are heavy. They were very cheap but unfortunately heavy at just about 16 lbs each. I ordered a set of two piece aluminum wheels that will be a solid 4.5 lbs lighter each while also being stiffer. In time I might just get down to the min weight for my class if I keep chopping away at it. I think I'll still be about 50 lbs over the min but that's not bad. - Lastly I installed a rear differential with taller gearing to reduce the number of 2nd - 3rd - 2nd shifts I need to make on Helena courses. I was running a 3.9 gear and swapped out to a 3.62. This combined with a slightly higher rev limiter setting (9000 rpms - part of the new ECU set up) should bump my top speed in 2nd gear from 58 mph to 66 mph. On some of the more open Helena courses I was shifting more than 10 times per run so this should help with that and help keep me from bouncing off the limiter as much. So what are you all doing? I know Russ has a big oil change planned and Alex is moving from a turbo 4 to a NA V6. Let's hear about that oil Russ! 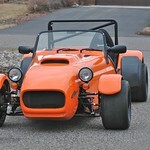 DaveMk1 wrote: Alex is moving from a turbo 4 to a NA V6. I'm also working on some minor suspension improvements. Building new chromoly control arms that should drop some weight and allow me to improve the geometry a little bit, and probably building some new thicker roll center adjusters as well. I changed my oil AND transmission/diff fluid. I'm doing what everyone with a 45 year old car does... which is mostly just trying to keep it in one piece long enough to make it to a race. At some point I need to figure out what causes the car to shake so bad at high speed (over like 70 indicated which is more like 60 by gps). For performance, I finally got the front control arms with my upgraded bushings off the front end of my old car, so I'm going to swap those over to the new one. Possibly install the stock carbs (if I can find a freeze plug). The idea there is that if I ever replace my 5 year old R888s I could move to STR, which is probably more competitive for me than CSP (not that I'm a competitive level driver). My stretch goal would be to install the exhaust system that's sitting in a pile in my garage. What kind of power do you expect from the V6 compared to the four? What might the curves look like? I actually have a bit more than changing the oil this year. Replacing the stock inlet pipe, spacers for the intake manifold, and the TGV delete (small butterflys in the intake path) and pump removal. I had hoped to get this done last year but just didn't get around to it. Also considering replacing the oil pan and oil pick-up to Killer-B items. The oil pick-up is considerably beefier than the stock one and the pan holds a additional quart of oil. DaveMk1 wrote: What kind of power do you expect from the V6 compared to the four? What might the curves look like? Toyota rates it at 269hp at the crank, but with intake, headers, exhaust, and a manual transmission they typically dyno significantly more than that at the wheels. It will be quite a bit less power than I had in my autocross tune before (that was roughly 100hp more), but it will be pretty similar, maybe just a little less than I had in my "track" tune. Hopefully the torque curve and the linearity of it will make up for it in terms of actual performance. It is also supposed to be quite a bit less weight as well. "They say" as much as 100lb saved... but I will wait until I have a chance to actually weight my car to say for sure. If your numbers end up anything like those you posted I would think that the car would be wonderful to drive hard and at the limit....easy and linear. I look forward to hearing and seeing it go. Well, looks like the kids will have to wait a year or two for college. Decided to take the jump and upgrade the intercooler and headers on the STI. Was planning on maybe next year but a opportunity to get it tuned after the install has come up. The stock intercooler must be made from tinfoil. All those bent veins in the intercooler can't be helping so upgrading to a coated Grimspeed intercooler. Oh, I know this. After what I had to go through to get the Cossie running this will be nothing Aside from upgrading the radiator and possibly adding a oil cooler I will pretty much be done with engine mods for now. Need to get this stuff done before the kids need a car - which will be happening much sooner than I want! The kids can always go to a trade school instead of university.